There was a full moon on the night of 5th-6th January 2015 and a consequent spring low tide (1.10m) the following day, at the convenient time of 1404 hrs. It coincided with a clear break in the changeable weather we had been experiencing, so Pat and I joined David and Avril Haines on part of their local shore, north of the pier at Culkein Drumbeg (NC1333), to see what we could find. First off, on the far side of the channel, was a bar-tailed godwit in winter plumage, feeding with three oystercatchers. This species is more often seen locally on passage in spring and autumn. Although sunny, there was a brisk cold wind, and despite equipping ourselves with rubber gloves, our fingers soon got quite cold, so our expedition only lasted for about an hour. The seaweed-covered rocks were fairly slippery, but we did manage to get down into the tangle zone, and collect some samples for later study. 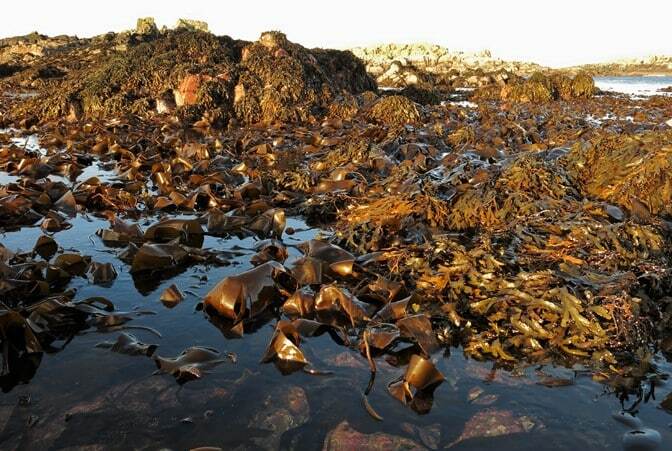 The intertidal zonation here is text-book for a sheltered shore, dominated by brown algae. Channelled wrack Pelvetia canaliculata occupies the top slot, just below high water mark, followed by a narrow band of the twisted fronds of flat wrack Fucus spiralis (sounds like a contradiction, but perhaps so-called because it lacks bladders). 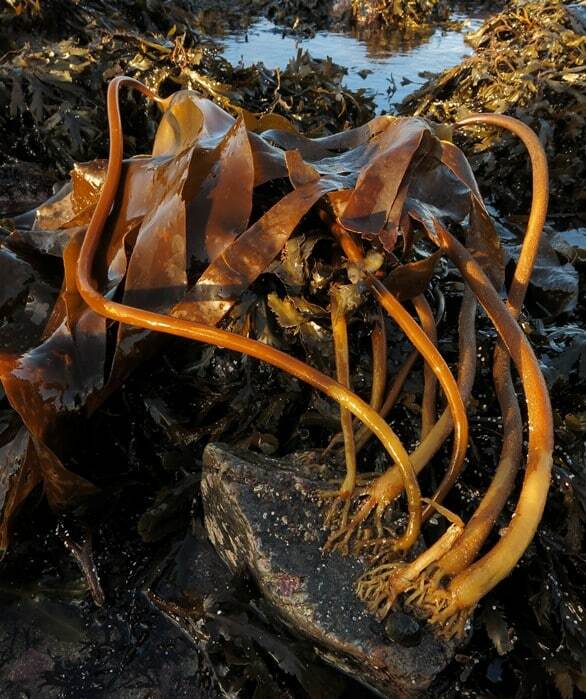 There is then a broad band of bladder wrack Fucus vesiculosus, intermixed with the long fronds of egg or knotted wrack Ascophyllum nodosum. Some of the latter had huge bladders, up to 5cm. long (Photo 1), and much of it was enveloped by a purplish-brown fuzz of the epiphytic red alga Polysiphonia lanosa. In the lower part of this zone toothed wrack Fucus serratus appears. 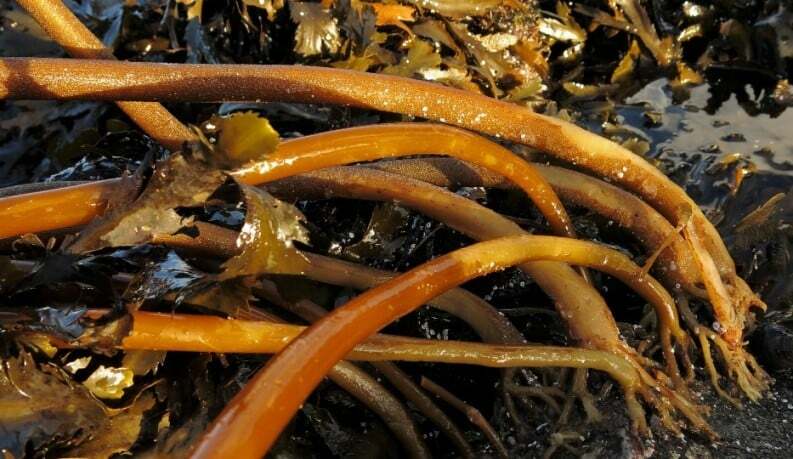 We then move into the kelps, here mainly the smooth-stalked tangle Laminaria digitata, with some rough-stalked cuvie L. hyperborea (Photos 2 and 3). 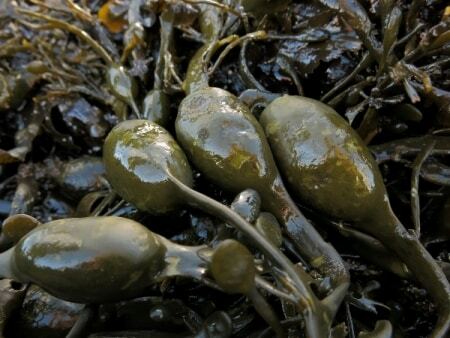 The only other brown alga of any size noted was podweed Halidrys siliquosa, whose fruiting bodies, about 2cm long, bear a marked resemblance to those of one of the larger members of the cress family, such as wallflower. However, there were smaller browns attached to stones, amongst them the thin, flattened, neatly-branching fronds of Dictyota dichotoma. Also on stones were tufts of the sparsely-forked fronds of Furcellaria lumbricalis, which are round in cross-section; it looks like a brown, but is in fact a red alga. Red algae come in to their own lower on the shore. Boulders exposed to the light bore delightful, continuous, purplish-pink crusts with whitish edges, the so-called ‘lithothamnia’, calcareous reds (Photo 4). Their texture is quite variable, smooth, pitted or knobbly, with concentric rings in places and frilly ridges where they overlap. The commonest two genera are apparently Lithophyllum and Lithothamnion, containing a number of species only identifiable by an expert. 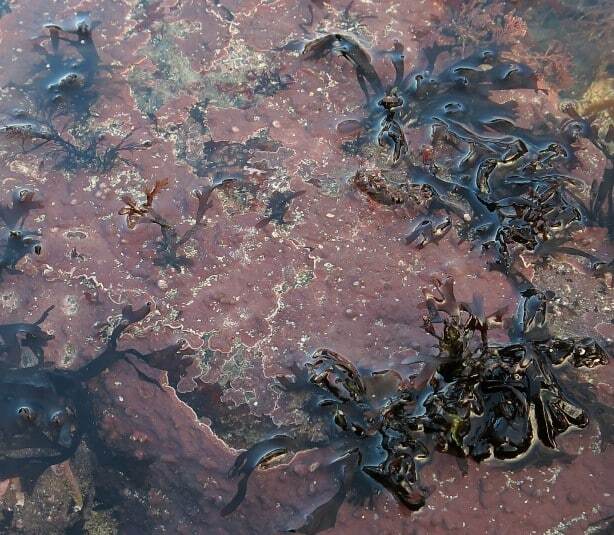 Other, more readily-named, reds included the branched, fancy-lettuce-like fronds of two species known as carrageen, Chondrus crispus and the rather similar Mastocarpus stellatus, both edible, and the broader fronds of dulse Palmaria palmata, with characteristic small branches around the edges (looking a bit like a tatty washing line). Amongst them were the abundant, tufted, pink, calcareous fronds of Corallina officinalis, which bear whitish fruiting bodies resembling the bulbs of fairy lights. I managed to name one other small red alga from its jointed fronds, Lomentaria articulata, but a variety of other stringy or diaphanous reds defeated me, although specimens have been pressed in case my skills improve with practice. Animal life abounds in these intertidal areas, but, bearing in mind the limitations of expertise and time, I brought back just a few fronds of toothed wrack with an obvious assortment of attached organisms (Photo 5).Commonest were the small, spiral, calcareous tubes of the polychaete worm Spirorbis cf. spirorbis; other polychaetes had built tiny cases of shell fragments and sand. There were a variety of sponges, both encrusting and purse-shaped, some alive, others reduced to elegant skeletons of siliceous spicules. A leathery, translucent sea-squirt with an orange-red interior was probably Ascidiella scabra. David also found, on the underside of a small boulder, a spongy mass of the egg capsules of a common whelk Buccinum undatum (Photo 6). The adults of this large carnivorous mollusc generally inhabit deeper water, but spawn low on the shore. 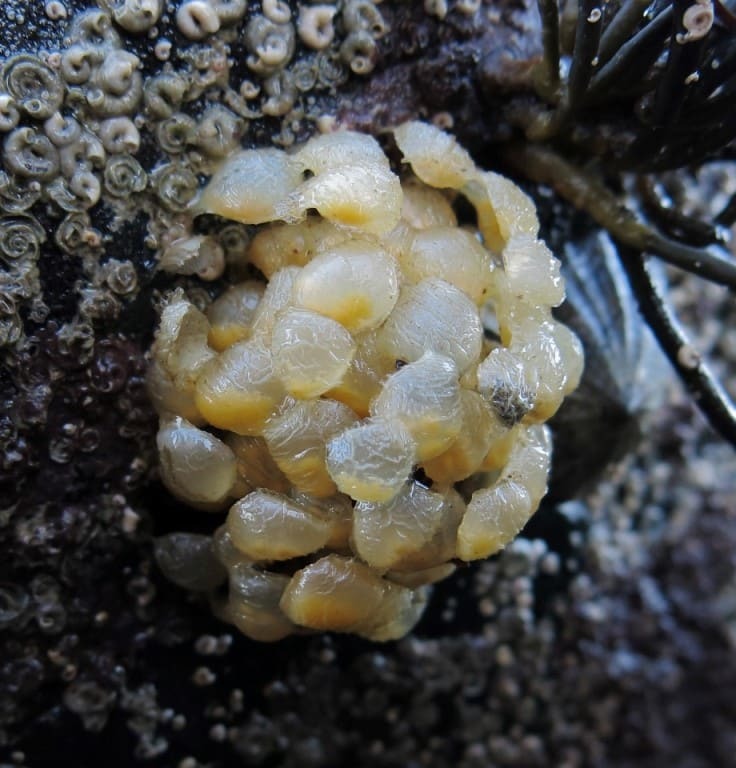 Spent egg masses are sometimes found washed up on the strandline, and are known as ‘sea wash balls’, apparently from their use by early mariners for washing. To an experienced student of this habitat, all very predictable, but an interesting reminder, for us beginners, of the wealth of life it supports. We retreated as the tide began to turn, and our fingers lost all sensation, to what we thought was a well-earned warm-up, accompanied by tea and cake.